After the Maine Diner, we met up with Chris Ayers, one of the main contributors to roadfooddigest.com, whom we had enjoyed meeting on previous Roadfood tours. He been of great help in planning our trip, and he had kindly volunteered to take us on a tour of area Roadfood places; this was one of the best excursions of our trip. 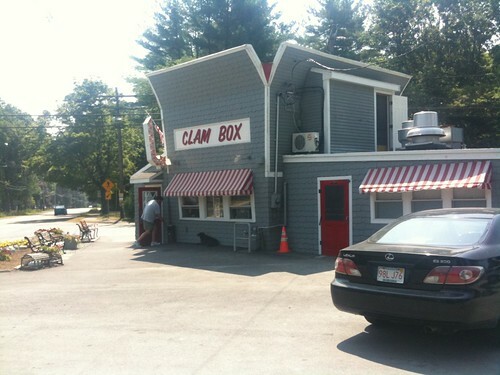 We met up with Chris at the Clam Box, famous both for the quality of its whole-belly fried whole-belly clams and for being shaped like a paper container of clams. The clams had a strong flavor that reminded me of silty sea-floor - at once earthy and oceanic. 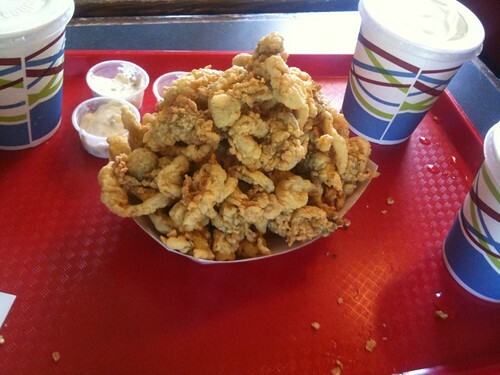 I can see why whole-belly lovers prefer the much more flavorful taste of the clam belly to the more rubbery, less flavorful foot, but I have not yet become fond of them. We three shared three pieces of pie. I had the strawberry-rhubarb pie. 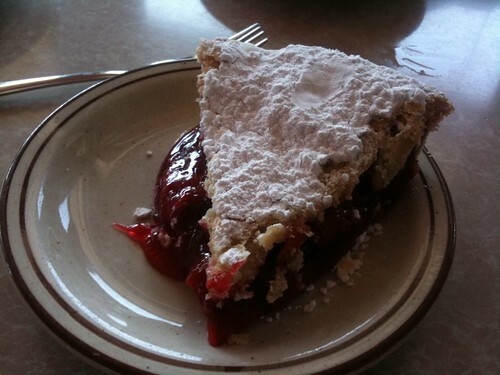 At this point, I don't remember much about the filling - I do remember that it wasn't cloying the way some strawberry pies can be, and the crust was firm and flaky, much better than an average diner pie. 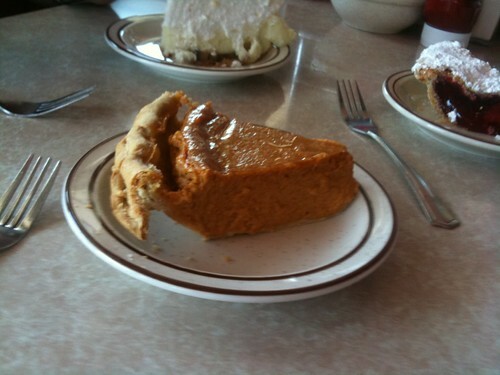 Lori chose the squash pie, because we were not familiar with squash pie. It tasted a lot like pumpkin pie. 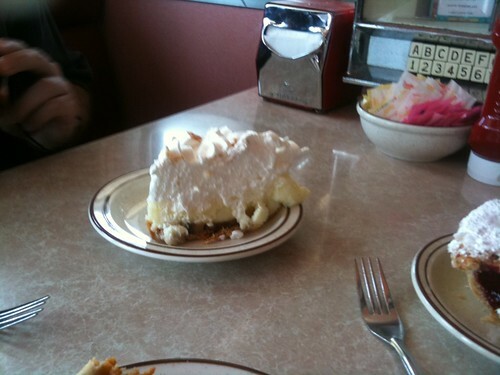 Chris chose the banana cream pie, which was very good - I'd give it the nod as best of the trio. We talked with Hallie for about an hour. She told us about her participation in the Great American Food and Music Fest, which did much to satisfy my nosy curiosity about the bad reports I'd seen on Roadfood.com. We told her about our delight at discovering a pair of dried cherry-almond turtles that had been mislaid after the New Orleans festival. She apologized for not showing candymaking to us because it was too hot and humid for candymaking. We had a great time talking with her, and would gladly go back again. For every person who came into the store, Hallie mentioned their preferred candy preferences. I no longer remember the details, but I feel that if I came in next summer, she would remember my fondness for the cherry-almond turtles. We bought a few things: a lavender caramel pop because Lori had enjoyed hers so much in New Orleans (very clear lavender flavor), a cayenne pop because many Roadfooders had spoken well of them in New Orleans, but she'd sold out before I could try them (just spicy enough to wake up the taste buds a bit), a "blondie truffle" (penuche in dark chocolate; Lori liked it a lot, but I found it too sweet), and more cherry-almond turtles. 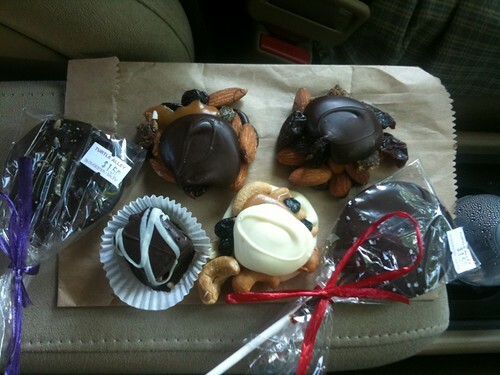 I think that the white turtle is Chris's purchase; I believe it to be white chocolate with blueberry. 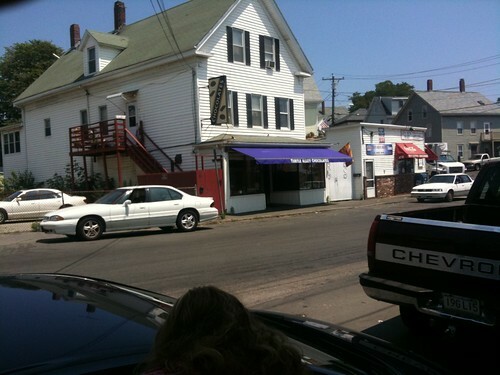 Fourth stop: Nick's Roast Beef. The roast beef sandwich didn't delight me, though the rare roast beef was vastly better than Arby's. 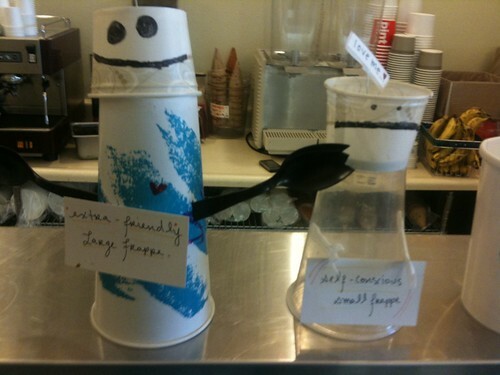 But the restaurant felt very friendly. The staff were interested in talking with us, and gave us a Nick's bumper sticker and their hopes that we'd add to their wall-ful of photos of their bumper stickers in exotic locations. 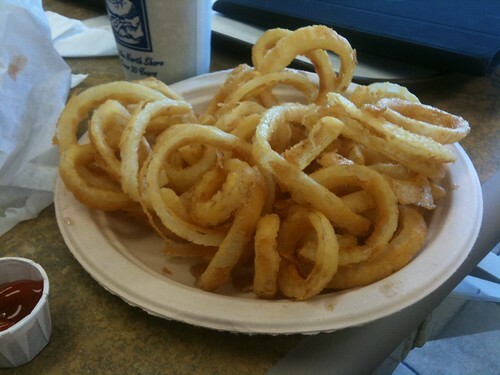 I was impressed with Nick's onion rings. They were very crisp on the outside, with insides that severed neatly at a bite, and they managed to maintain their crispness to the very last one. From there we headed closer in to Boston (I think; I just followed the GPS without a true understanding of the geography) to Tripoli Bakery, because Chris was interested in sampling their bakery pizza. I cannot remember the distinctive qualities of bakery pizza, but it hardly matters, because they were no longer serving pizza that day. 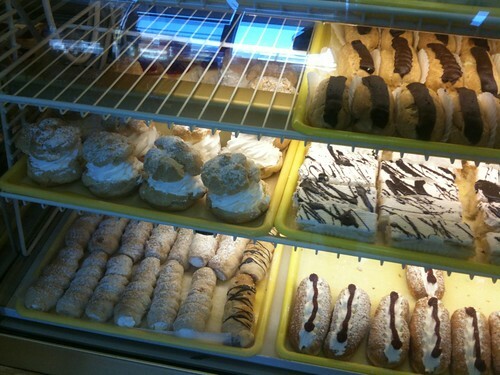 We chose a cannoli because they had signs behind the counter saying that the cannoli were filled to order. (I remember that there were multiple choices involved of filling and shell, but we chose something fairly standard.) This was a really good cannoli: the shell was very crisp and delicate, so much so that you could bite through the shell easily without squishing out the filling. 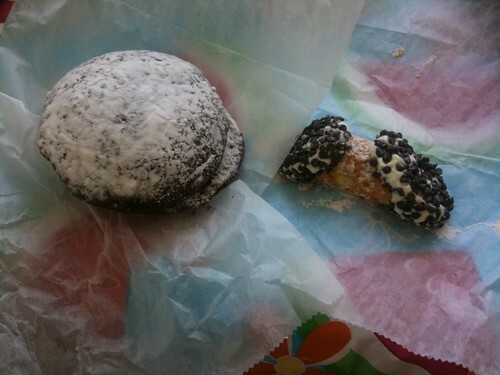 I am now convinced that filling cannoli just before eating it does make a big difference. We also had a whoopie pie, which was fine but not memorable. 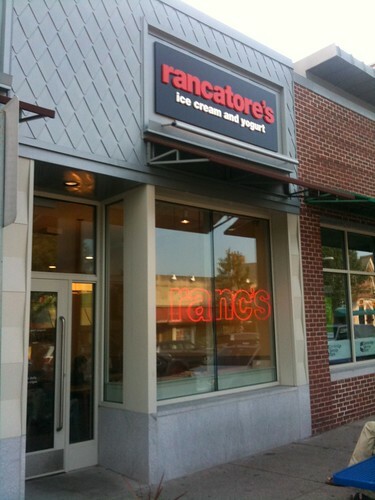 Our last stop with Chris was at Rancatore's Ice Cream and Yogurt, and this stop was one of the highlights of our trip. Lori had the bittersweet chocolate ice cream with hot fudge sauce. When I asked Lori for a description just now, she looked at me soulfully and said "there are no words." 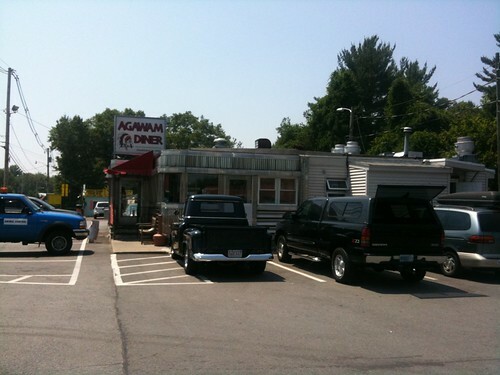 The hot fudge sauce was really outstanding, thick and dark and rich. 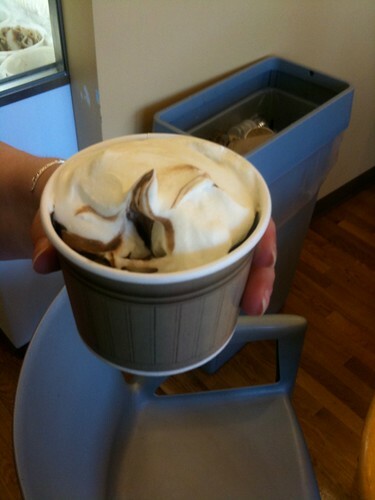 Lori says, "The ice cream was sinfully rich and delicious. It had a wonderful bittersweet chocolate flavor in all the best senses of the word, really just perfect." Chris had grape nut with raisin ice cream, which I sampled but have little memory and no photograph. 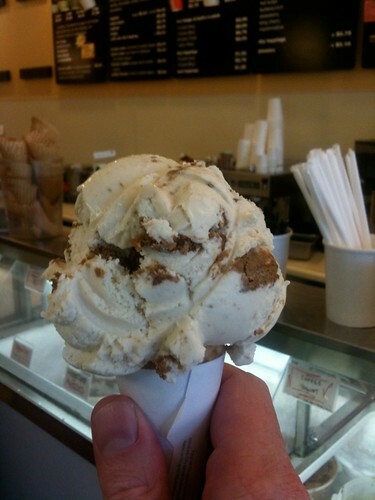 I feel that I got the best of our three choices, though, with my gingersnap with molasses ice cream. It had a stunningly bright, rich flavor, like a brass band playing. It was absolutely splendid, a perfect ten out of ten - except for the realization that it could be even better, because if it had been paired with that thick sensuous hot fudge sauce, the flavors would have gone together like lovers embracing. I am bugged by the contradiction between "perfect ten" and "better with hot fudge", because making contradictory statements confronts me with the fact that I'm not as rational as I like to believe. But despite that, I am not willing to recant either of those statements, so you and I will just have to live with the contradiction. (Perhaps the resolution to the contradiction is that by "perfect ten", I really mean "more delicious than I can evaluate.") Clearly more research is called for to resolve this question, ideally research involving gingersnap ice cream with hot fudge sauce. 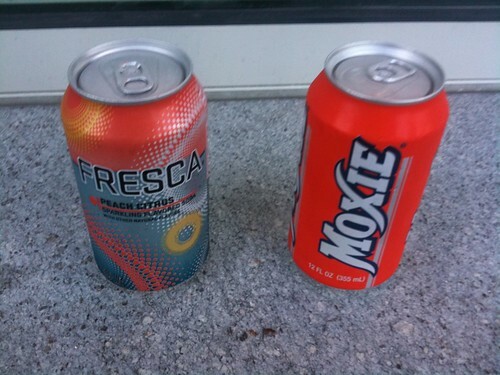 Lori wanted to get a drink after we finished our ice cream, so I ended up with a can of that New England specialty, Moxie. It was an unusual flavor, and I'm not sure how to describe it. I'd read descriptions of it as bitter, but I didn't identify it as particularly so (though perhaps more bitter than sour or sweet); what I really noticed about it was that I tasted it almost exclusively at the back of my tongue, even when I brought it forward in my mouth. It was very odd. Chris was a delightful host, and we enjoyed chatting with him all day and enjoyed the food tour he gave us. I hope that we can provide such a splendid tour to visitors to Pittsburgh.